can a guy get a quilt around here? 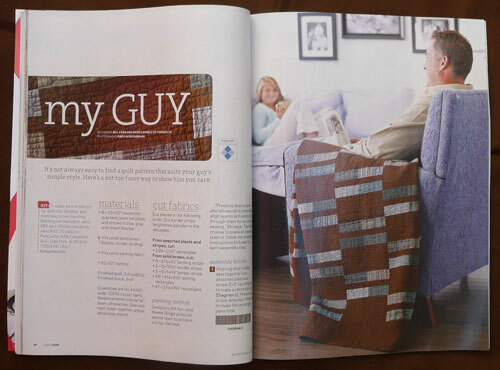 Our My Guy quilt is in the current issue of American Patchwork & Quilting Magazine. The quilt is made from yarn-dyed plaids and a chocolate brown solid. 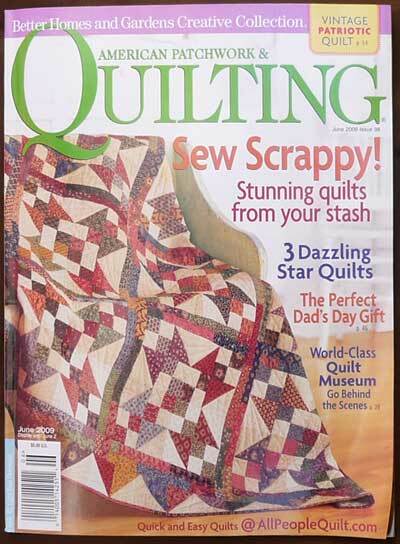 We proposed this quilt to the magazine after a recent trip to local quilt shop. What used to be a quilt shop with a balance of neutrals, homespuns and prints had, in the course of a few months, become Girlsville. 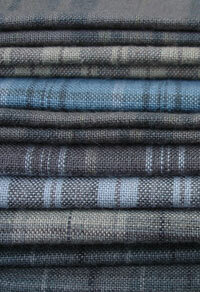 I had gone into the shop looking for a simple grey tone-on-tone for a custom quilt we were making. Unbelievably I was unable to find a single yard of a simple grey without some dominant girly print all over it. I love big prints as much as the next girl but I felt sorry for all of the men that must have to sleep under a lot of over-sized, pink cabbage roses. Were the shoe on the other foot, I wouldn’t enjoy having a bedroom decked out in olive camo fabric! So to all you guys out there, I feel your pain and wave the olive branch of plaids to you all! This is excellent–I really love more options for non-girly quilts! You’re right–it’s hard to find masculine fabrics out there. Thank you for putting this out there. I saw your quilt in the magazine but didn’t make the connection to you. Love the quilt! Me and my quilting buddy–who is the quilting opposite of me–picked out your quilt in AP&Q as one we both wanted to do. Love your bold, versatile pattern. Thanks! A tricky subject indeed, but a good one! Surely there must be males over the age of 4 who also deserve to get nice quilt gifts that they’d enjoy. Yours looks great! Congrats on the mag. The first thing I do when I get my new American Patchwork and Quilting magazine is look to see if there is a new pattern from you and Bill. I always love them. Thanks! I love that stack of Yarn Dyed Greys. Your Patterns are always so great.. … Always! I appreciate this very much. I’ve been wanting to make a quilt for my son and despaired of finding an idea that would not involve any feminine frills. Thank you! Masculine fabrics are at a premium. I made a rag quilt for our bachelor son’s contemporary loft using 100% wool men’s suiting fabrics in browns and taupes. It is my favorite!